Comprehensive, Two-Part Set of Investigations. 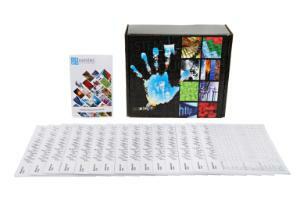 This kit was designed to introduce students to the chemistry of living things and relate biochemistry to everyday life. Includes five basic biochemistry experiments in which students use chemical methods to test for proteins, carbohydrates and lipids, use Pepsin to digest proteins, and Ninhydrin to detect amino acids, test the activity of salivary amylase (both in vitro and in vivo), develop a technique for determining ascorbic acid concentration and use it to evaluate the vitamin C levels in substances, and determine the alkalinity and acidity of foods. A great exploratory or introductory experience is gained by performing the test procedures. Required but not included: a hot plate or water bath, glass rods, and food samples for testing. Designed for 24 students working in six groups of 4.